As usual with these Retro Reviews, I like to try and learn a little something about the comic at hand and then share some of my new knowledge, if you don't mind indulging me a few paragraphs. . . I came into possession of this comic as part of an auction lot of "collector comics" I bid on about 5 years ago. I ended up paying $75 for 10 comics from the 1960's. The one I REALLY wanted was a beautiful copy of Gold Key's King Kong adaptation. . .not the most valuable in the lot, but what a cover! I usually buy older comics for their covers, since I have a rotating collection of comic book covers on my office wall at work. Since this particular comic has a sort of "Meh" cover, all it ever got was a quick flip through before it got boarded, bagged, and exiled to the "T" box of my collection. But since I don't have too many older horror comics, I decided to give it a chance and take a closer look for this Halloween Retro Review. . .and upon doing a bit of research, I discovered there's some interesting things about this unassuming comic book with a somewhat crappy cover. . .
First off, that cover I keep bagging on (It's not BAD, just sort of "meh") isn't the original cover for this comic. Jim Steranko originally had another cover ready to roll, but it was nixed by Editor Stan Lee in favor of the John Romita Sr. cover you see above. Here's Steranko's original cover. I couldn't find a color version. To tell the truth, I still don't think it's great, but I DO like the logo better. 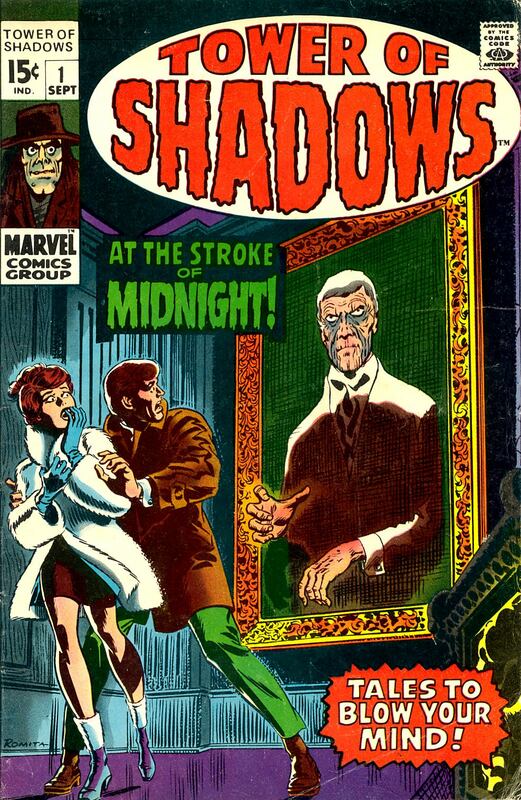 In addition to rejecting Steranko's cover, it seems that Stan Lee (for some unknown reason) forced an unusually heavy editorial hand over Steranko's entire contribution to this comic (the first story, At The Stroke Of Midnight). 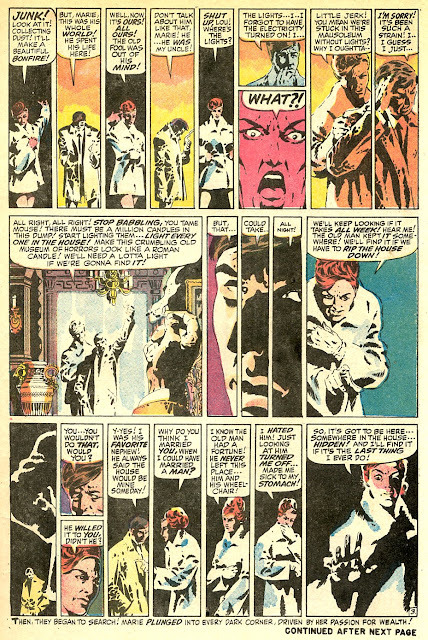 Apparently, Steranko and Lee clashed over panel design, dialogue, and even the title of the story (It was originally called The Lurking Fear At Shadow House). 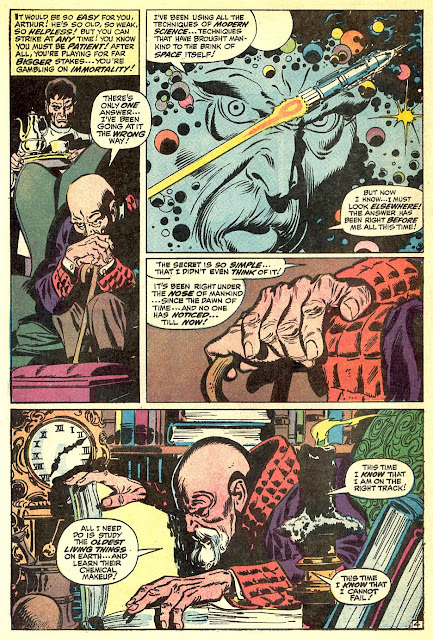 From what I've read, Steranko wanted the story to be a more overt homage to Lovecraft, while Lee just wanted something the kids would like. It seems that after Lee changed some of Steranko's dialogue in the finished story, Steranko either quit or was fired (the story is a bit unclear, with conflicting interviews). Steranko DID return off and on during the 70's to do some covers for Marvel, but basically this was the comic that ended his superstar days as a regular writer/artist for Marvel. The story that caused the rift between Lee and Steranko went on to win the 1969 Alley Award (an early comic book award program) for Best Feature Story. To be fair to both Lee and Steranko, there's an interview years later where Steranko admits that MAYBE he might have been up on a bit of a high horse and probably should have let Lee do his job editing the story because. . .well. . .Lee WAS the editor after all. But enough background. Let's get into this comic book, shall we? AT THE STROKE OF MIDNIGHT! In this award-winning story, the meek Lou Fowler and his overbearing wife, Marie explore the mysterious mansion of Lou's recently-deceased Uncle (and not deceased by natural causes. . .Lou pushed him over a cliff at the urging of his wife), searching for his hidden wealth. During the search, Lou is terrified by a ghostly image of his murdered Uncle pointing to a room that had always been locked. Beyond the door is a strange library filled with books on witchcraft. Inside the library, the couple find a door that only opens when Marie accidentally cuts herself and spills some blood. Beyond the door is a trove of gold and jewels. As Marie celebrates her new-found wealth, Lou is horrified to discover the way behind them gone, and the only exit from the room leads to an angry crowd. . .somehow his uncle discovered a way to open a portal in time to the French Revolution, and standing beside a waiting guillotine is the uncle himself, commanding the crowd drag Lou and Marie to their deaths. Okay. . .a pretty good opener. I didn't realize the connection between the names of Lou and Marie with their eventual fate until I read the story a second time for this review. It's a nice, under the radar touch. This whole story is very well written and with the tense atmosphere, the squabbling husband and wife character moments, and twist ending I can EASILY see this little tale as being a great Twilight Zone T.V. episode. The art is simply superb. The panel setup is brilliant, and enables a lot of dialogue in a little space. The figures and backgrounds are excellent in every way, and this unassuming little story is a great illustration of why Steranko was such a superstar during that time. There's plenty of modern artists that could stand to learn some lessons from studying the way this story is laid out. The art in this story was not what I expected from a Silver Age comic at all. Arthur Watson is a writer deeply in debt desperately trying to finish a book about famous Spiritualist investigator, Hayden Hathoway. Hathoway is relentless and obsessed with exposing fake Spiritualists, but Watson can't figure out WHY, and Hathoway isn't telling. On a stormy night, Watson and Hathoway attend a seance put on by the beautiful and enigmatic Madame Angelica. Unlike other nights where the deception has been easily spotted by Hathoway, the spirits summoned by Madame Angelica seem to be real. When the seance ends, Hathoway flies into a rage, destroying the furnishings of the room and trying to find evidence of trickery, but finds none. Watson is astonished to see that Hathoway is happy at finally failing. When Hathoway confronts Madame Angelica, she informs him that she knows his secret. Hayden Hathoway has been dead for years and the Hathoway before her is a spirit that has been searching for a true medium who can guide him into the afterlife. . .which she does, leaving Watson alone and realizing that he'll never be able to finish his book because nobody will believe him. It's not a bad story, but the twist ending falls a bit flat. Hathoway is a spirit that's looking for someone who can open a door to the spirit world. Okay, fine. The problem here is that Hathoway is substantial enough to not only be a celebrity worthy of writing a book about, but to also physically tear apart a room. It doesn't make a lot of sense and it almost seems like the ending is a bit tacked on. The art is much more in line with Silver Age comics, and is actually better than a lot I've seen. I'm not a fan of a lot of 60's comic art, but with its heavily-inked lines and expressive characters, the art on this story is definitely on the good end of the Silver Age scale. Like I said above, this isn't a bad story at all. Except for the twist ending falling really flat, it's actually pretty good, making Tower of Shadows 2 for 2 for good stories. For a 60's anthology, that's a strong showing so far. Sebastian Scrogg is a wretched old man, but a brilliant scientist. Along with his mute assistant, Arthur, Scrogg is desperately in search of a scientific path to immortality. As he fails in his experiments, Scrogg becomes more and more abusive to Arthur, never realizing that his assistant is smarter than he lets on and is secretly biding his time in order to steal the secret of immortality if Scrogg discovers it. After distilling the essence of the Redwood tree into a potion, Scrogg is finally successful in his search, but his celebration is short-lived as Arthur beats the old man to death, steals the formula and drinks it. Afterwards, Arthur discovers to his horror that the formula works and he will be immortal. . .but in the form of a tree rooted in place for thousands of years. I saw the Silver Surfer team on this story and was right on board with a hearty "Hell Yeah!" Unfortunately, the story is pretty weak. It's not bad, let's get that straight. It's well written, but it's just really predictable. The twist ending is telegraphed pretty hard, but I can still see this as being a pretty good episode of The Twilight Zone on T.V. The art, on the other hand. It easily competes with Steranko's opener. It's a completely different style, but the dark, exaggerated lines and extreme background detail make every single panel of this one something that your eye just lingers on, soaking it all in. 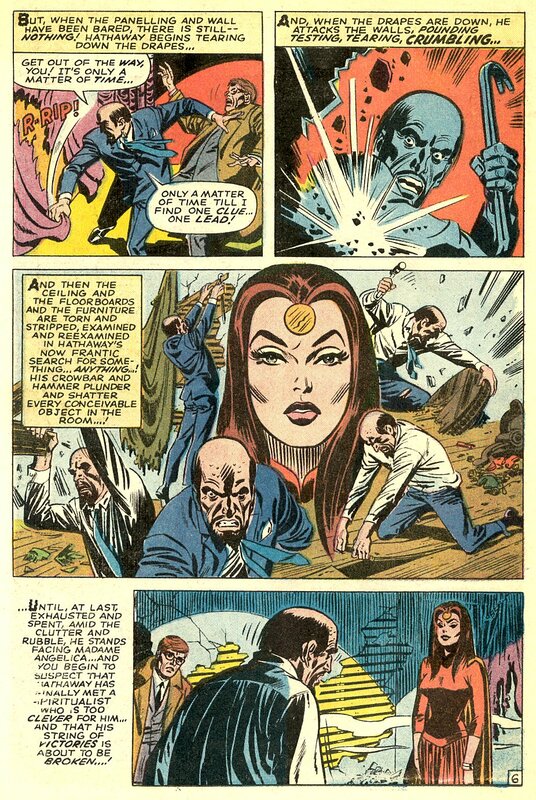 This unassuming little entry might not be the best story, but it's definitely a showcase for Buscema's fantastic art. I sort of bought this comic by accident and never read it until now. . .and I have to say that I am glad I did. I learned about an interesting piece of comic book history AND I got to enjoy 3 good stories. . .two of which had some fantastic art. For a Silver Age anthology title to get it right 3 for 3 without any reprints (Tower of Shadows has all original material) is an EXTREMELY strong effort in my book. The stories aren't perfect, but they aren't bad either. And like I said, two FANTASTIC artist showcase stories and one that's not bad at all makes for a one good looking comic. Overall, I'd say that Marvel definitely hit it out of the park with Tower of Shadows and it's well worth a read. They say never to judge a book by the cover, meaning don't let a pretty cover fool you. 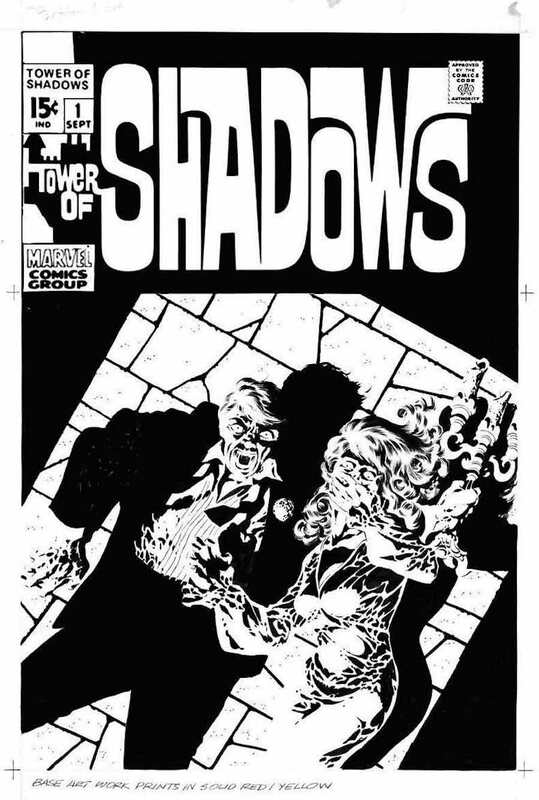 But sometimes it goes the other way as well. . .under the utterly average cover of Tower of Shadows is one damn fine comic. You guessed it, MORE Longbox Junk Halloween fun! What a beautiful book and terrific synopsis. I will have to say that I prefer the Steranko version not chosen, but this cover is nonetheless a work of art. Being a HUGE Steranko fan, I appreciate the back story of the clash with Stan over the cover/story/art. It is always interesting to hear the behind the scenes details about creators and books. Like I said in the review, half of the fun of getting into some older and more "Valuable" comics now and then instead of my usual dollar box finds is learning a little bit about the story behind the comic. . .and this was a pretty interesting one. Thanks for reading! I appreciate all the background detail you provided. I'd definitely grab this comic if I found it at a decent price.